How lightening your payload on your next excursion abroad can save you time, money and the mental anguish. Packing carry luggage only, has become the smartest and most efficient way of traveling for today’s modern day jet-setters. In today’s modern day high-paced atmosphere travelers are always seeking better ideas on saving time, stress and money during their time away from home. There is always the standard pressures associated with any journey abroad. The airports, transfers, international visas, cash flow and the logistics on it all. So why add the unnecessary stresses? If properly prepared you can begin your journey in a positive way by simply following some helpful tips to ensure your peace of mind during transit. By taking advantage of our reviews to find the best carry-on luggage for each budget, you’ll be able to start packing lightly and quickly discover the advantages of traveling with only your carry luggage. Traveling is essential for the majority of modern day people. Whether it’s for pleasure or work. Just setting out for a destination is always an exciting time in everyone’s life. Particularly if you’re heading to a new location you’ve yet to experience in your life. As Jimmy Buffett once sang, Changes in Latitudes, Changes in Attitudes nothing remains quit the same….so true Jimmy! However, traditional protocol usually includes jet-setters packing bulky check-in luggage and the headaches associated with it. Today, in many cases with the greedy airlines, they’ll charge you a small fortune for any excess weight on those bags too. Leaving you aggravated even before you’ve left home turf. Urrghhh! Learn more about the advantages of traveling light and get the most out of your next getaway without the hassles of lugging around your entire wardrobe, including that kitchen sink! Like anything accomplished successfully in life, preparation is the backbone to it all. Take into account all aspects and details of your upcoming trip. By answering a few simple questions you’ll lay the beginning foundations and start reaping the advantages of your new ‘carry-on lifestyle’. What is the climate and weather forecasted at my final destination? Will I have access to laundry services or self service facilities? What are the airline regulations? ie: packed liquids, aerosols spray, sharp objects considered contraband by authorities. Size and weight restrictions for carry-on bags? Do you need to purchase a proper carry-on bag for your needs? Will you be shopping on vacation? Any additional excursions such as water or outdoor activities? Answering these questions gives you an overall understanding of how much packing will be required. For me, question #3 has the utmost importance. 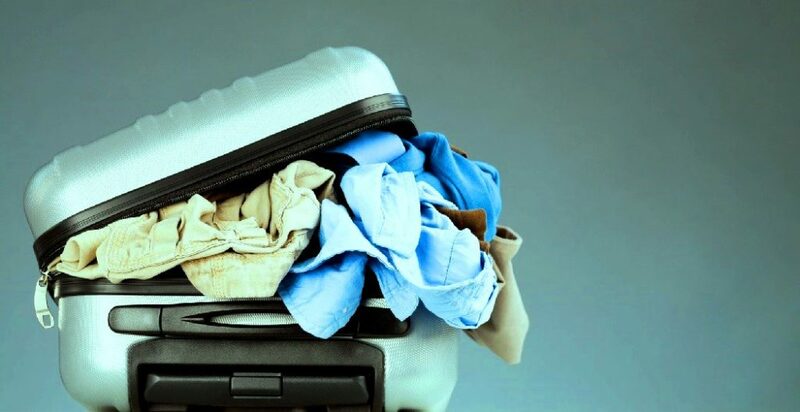 Most travelers find they have access to laundry service within their accommodations which allows you to recycle your dirties for another round of use and enabling you to pack less. You can cut down 75% of your wardrobe if you have access to a laundry service. Beyond your carry luggage, note that most all airlines will allow, free of charge, one carry-on bag plus one backpack or satchel as well; if this is not the case then you might as well check out some full sized spinner luggage to take instead. This extra space opens the door for so much more flexibility in your preparation. In my case I always travel with a messenger bag kind of like a satchel (or shoulder bag) which includes all my travel docs, passports, onboard flight entertainment (iPad, books/mags, work, etc), and mobile phone. Basically anything that you might need during the flight or soon after your arrival. This is where prioritizing plays an important role. Prioritizing your gear, like this Osprey Porter 46, in a efficient and orderly matter will make life so much easier. Keeping important documents readily available is the key to zipping through security check points at the airport allowing you easy access to your vital documents while clearing customs making for a seamless experience from tarmac to curbside. Keeping your wallet accessible makes for inflight purchases a breeze without having to disrupt fellow passengers while trying to dig it out of your carry-on bag or duffel bag. The idea is to optimize your space to work for you so you’re not creating chaos and stress for yourself and those around you. Here’s the vocal point of it all in my humble opinion. The reason I made the transition to a carry-on lifestyle was this lone factor— time! 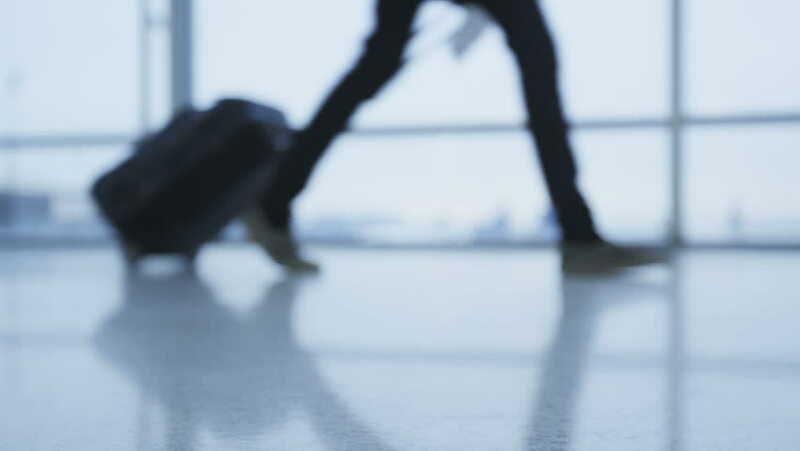 You ask any experienced traveler like myself about their experience with lost or damaged luggage and you’ll hear the same grumbling from everyone. It’s honestly the pits! There’s no getting around the numbers, the more often you fly the increase chances your luggage will eventually get lost or damaged. Take my last nightmare experience for example. I landed in Buenos Aires for vacation, got off the plane and went through customs. Then onward to baggage claim where I waited and waited before luggage started arriving on the carousel. I continued to wait and wait and wait even more. Finally the last of the luggage was delivered and I’m left standing their empty handed. I had no luggage! I again waited in another line just to file a lost baggage claim (with many others as well) with the airline before proceeding to my boutique hotel with nothing but a backpack full of non-practical amenities and the stinky clothes on my back. To this day my bags were never recovered by the airline and I was compensated for my losses. However, I’ll never get that time back I spent waiting, the headaches it created and the epic blowout argument I had with my girlfriend. So rather then spending my precious time in Buenos Aires enjoying the itinerary I desired. I ended up spending half the trip shopping for new South American fashions. I’m not a small man, nor a huge man. I’m a standard sized American male standing at 6 foot 1 but I lift regularly and so a lot of clothing already fits very tightly. This made it basically impossible to find a local size to fit my frame. The Argentinians wear the smallest, tightest fitting fashions I’d ever seen and it didn’t suit my body type at all. So I was completely uncomfortable the entire trip, even though, my girlfriend seemed to get a good laugh out of it all. Beyond that I could elaborate more on other stories of lost luggage and brand new expensive bags being damaged in transit, but I won’t bore you with the details now. In 2016 reports show that the airline industry had over 3.5 Billion paid passengers worldwide. 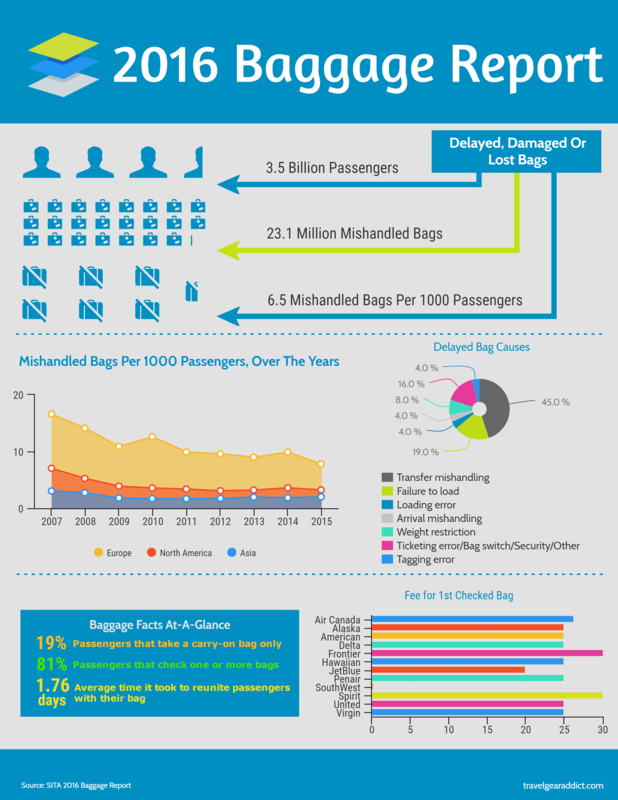 From that there were 23.1 Million mishandled bags averaging 6.5 mishandled bags per 1,000 passengers. By traveling with only carry luggage, like this Bluboon Weekender, you’ll bypass the chaos of the baggage claim and you’ll be avoiding that dreaded line at the lost luggage office. You’ll have your carry luggage at your side the entire time and you’ll proceed directly to curbside with peace of mind and begin your memorable adventure without having to deal with the headaches and time commitments involved with lost or damaged bags. It’s worth its weight in gold, trust me! Money money money! Why waste it on those greedy airline policy? To answer that question, you don’t have to if you choose wisely. This might be where most people fall in with transitioning over to a carry-on lifestyle. Today’s airline industry is a total mess and their policies are repulsive at best. Some of the better airlines will include one check-in bag with the cost of the airfare. Though the rest of them will happily charge you for any check-in luggage you decide to book at only a small fee which requires a home equity loan to pay. You can find the latest checked baggage fees here. United Airlines charges $25 for your first bag, $35 for the second and up to $200 for a third. Not to mention, the excess size/weight fees tact on top if you go over the policies allotted requirements. Absurd to pay out the wazoo for these baggage fees and United Airlines has by far one of the most reasonable rates in the industry. Environmental fees? That’s correct, environmental fees aren’t necessarily a monetary fee but that intangible fee on the environment. For every check-in piece of luggage through the airline requires manpower during transit. Manpower is heavily relied upon by industrial power which in a nutshell means natural resources such as gas and/or electrical power are essential in this cycle. All generating greenhouse emissions and creating more Co2 into a already afflicted environment. So by implementing a carry-on lifestyle, you’re doing your part to save the environment, albeit small, every bit counts. First mistake many people make when packing their carry-on is they begin preparing their wardrobe for packing before anything else. Hey, I’m just as guilty of this too. However, I learned over time that it’s vital to start with the carry-on bag before you consider packing a single item. Let’s begin with the bag itself. Like this Delsey Chatelet, you’ll first want to open it, clean it, organize the straps, locate any hidden compartments, additional pockets — survey the entire unit. Once you know your bags’ capabilities you can begin looking at your wardrobe and other amenities for packing. Now that you have thoroughly surveyed your carry-on bag you should be quit familiar with the allotted space with a general idea of how much to pack. Next step is begin gathering your gear. Don’t pack anything just yet, though, begin to layout your options on the floor or on the bed or anywhere you can visually look at the entirety of it all. Don’t worry if it seems like an excessive amount of packing, in most cases, it will be. However, it’s best to start with more then less at this stage. This is the tricky bit for many. Now that you have your unpacked bag laid out before you, it’s time to chisel it down to size. Things such as toiletries. Most all toiletries can be left out, shampoo, conditioner, lotion, etc will be supplied by your destination’s hotel, if not, you can purchase on the other side of transit and dispose before returning home. Toiletries take up ample space and we’re ultimately trying to minimize down to the bare essentials. Next stage, filter out the wardrobe. This takes time with a little practice and confidence you’ll master this in no time. By simply packing clothes that can be recycled into multiple outfits works wonders. For me this is easy. I’m not that fashionable of a guy to begin with (unless I’m in Argentina of course) so t-shirts, shorts, flip-flops and I’m ready to go. However, women like my girlfriend who live a life of a fashion model find this a daunting task. She’s come up with a terrific technique with the ability of creating new stylish outfits by recreating different color schemes and accessories to give the illusion of a new outfit everyday. Small changes such as a new blouse with the same daily jeans accompanied by small accessory revisions of a scarf and/or head-ware bring a new outfit on a daily basis. Is it ideal? Probably not, but she’s now happy to travel this way and ultimately she’s even admitted it’s worth the sacrifice of not having to check-in those heavy over priced bags at the airport. A technique developed by the military many moons ago, the roll technique is still rolling strong today. Pardon the pun! 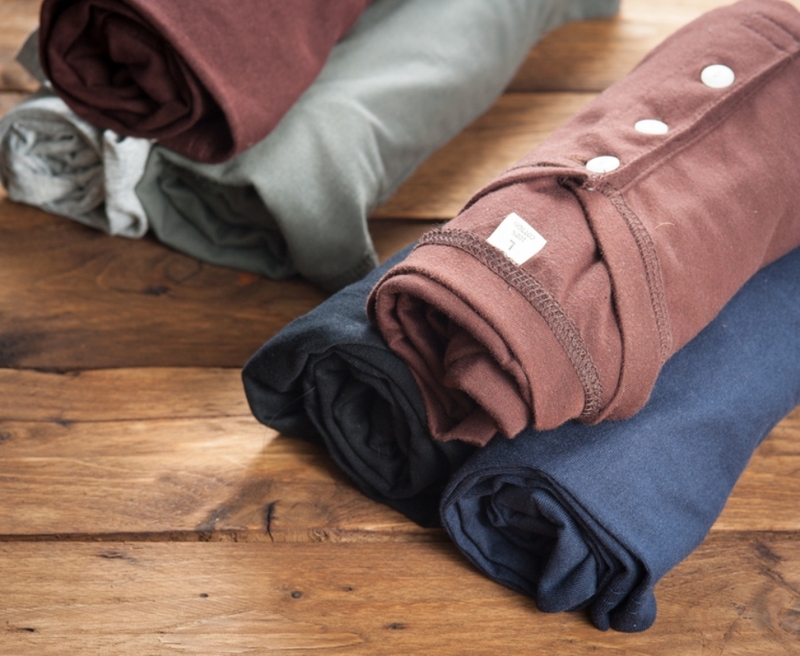 By rolling your clothes for packing it allows you to maximize your space and help decrease the overall wrinkling of your clothes. Don’t let any space go untouched. Remember after surveying your bag, you should know where every hidden compartment is located. Fill it up to capacity and make every inch count. If you want to keep everything extremely organized, consider using packing cubes to maximize your packing space. Of course this isn’t the first and only article online about packing techniques. There’s so many wonderful websites dedicated to methods of packing. Pay a visit to a few of these sites and see the endless amount of options there are for packing. Apply those that seem fit for your journey and even come up with your own version as well. Obviously circumstances play a role for a carry-on lifestyle. If you’re going to your destination wedding then you’re not going to bother trying to smash a wedding dress into a carry-on bag. Though in my experiences, for a standard long weekend getaway or even a lengthier 2-week vacation, a carry-on lifestyle can absolutely be accomplished with ease. If applied correctly, your travel day will be so much easier. As if you’ve gone straight to the front of the line of your favorite Disney ride. Plus your pocketbook will be grateful, and you won’t ever be caught wearing some god awful Argentinean fashion that your body and mind won’t fit around. Now carry-on my friends and go see this beautiful world we call home! Have additional tips or advice? Leave them in the comments below!